The Trade and Transport Facilitation Monitoring Mechanism (TTFMM) National Training Workshop for Bhutan provided detailed training in the integrated methodologies of (i) business process analysis (BPA), (ii) time release study, and (iii) time-cost-distance survey approach. The objective was to equip participants with the required knowledge and practical skills to establish baseline data for monitoring trade and transport facilitation in Bhutan; undertake a national TTFMM study; and thereafter identify necessary measures to develop more efficient and transparent trade. The training followed the TTFMM inception workshop held in Bangkok in November 2013, where SASEC countries agreed to undertake national workshops, supported by the Asian Development Bank (ADB), under the SASEC Trade Facilitation Strategic Framework 2014-2016. The ADB will provide funding for the TTFMM, and UNESCAP will provide continuing technical expertise. Business process analysis methodology — six training modules, using BPA techniques and assessment tools, covered an introduction to BPA methodology; planning and scoping of a national study, including resource management; data collection and analysis; and possible recommendations, such as business process simplification or business process automation. Time release study methodology — six training modules introduced TRS methodology, using specific study materials; TRS process mapping, using process charts, flow of customs procedures, and questionnaires for analysis; shared experience of other countries’ application of TRS; and practical exercises on TRS scoping and other elements. Time-cost-distance methodology — training modules for TCD included a general introduction to the methodology, its features and benefits; practical application, including data collection and processing with software application; key issues in preparing TCD studies; and best practice and lessons learned in designing TCD study components. A TTFMM implementation template was presented as a basis for further deliberation, focusing on (i) selection of corridors and products; (ii) institutional arrangements including formation of TTFMM team; and (iii) an implementation schedule. Mr. Yonten Namgyel, Director of Department of Revenue and Customs of Bhutan opened the workshop. Participants included senior government officials from the departments of Revenue and Customs, Trade, Immigration, Roads, and the Bhutan Agriculture and Food Regulatory Authority. Representatives of the private sector and freight forwarder associations also participated. 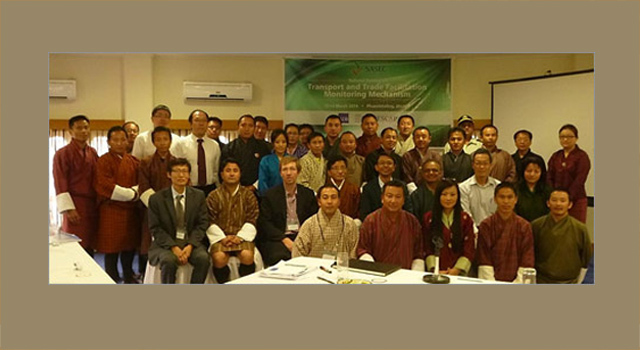 Bhutan’s Department of Revenue and Customs organized the workshop. ADB provided funding. Technical expertise was provided by resource persons from UNESCAP and WCO.